I am often asked where is the best place in a home to store the ashes of a deceased person or pet. My answer may surprise you! This type of question appears quite often in my inbox. Sometimes it’s about the ashes of a deceased pet, and sometimes it’s the cremated remains of a beloved partner or family member. The ashes are not clutter, of course, but if they are kept indefinitely because of frozen grief, they can become so. Over the years I’ve had many opportunities to hand sense cremated remains stored in peoples‘ homes. Hand sensing is an advanced technique that I do at the beginning of a space clearing, clutter clearing or feng shui consultation to read the energies imprinted in walls and objects. It gives access to a much deeper level of information about a property and its occupants than can be seen with the naked eye. I’ve been doing this for over 35 years, and have developed it to the level of accuracy where reading imprints with my hands is as tangible for me as reading a book with my eyes. I have always found that cremated remains are completely energetically inert. In other words, the process of cremation leaves no trace of the deceased person or pet at all. The physical body is reduced to dust, the etheric and astral components that once made up the living being disintegrate, and the spirit returns to the realms from which it came. So on an energetic level, there is no reason at all to keep cremated remains. Nothing of the essence of a loved one remains attached to them. However, if ashes are kept too long, stagnant energy can accumulate around them. And if the grieving process is not complete, both the ashes and the container they are kept in can become imprinted with layers of sadness, which in turn can prolong the grieving. It’s not a happy state of affairs. In the case of a deceased person, it’s ideal if they have stipulated in their will the manner in which they want their body to be disposed of, and if cremation is their wish, what they want to have done with their ashes and how quickly they would like this to happen after their death. The person charged with this responsibility will then know exactly what to do and when it needs to be done by. In the case of a pet or someone who has left no instructions, many people choose to scatter or bury the ashes in a place that would be meaningful to the pet or person in some way, such as a favorite place in nature. All too often the real issue is not about how to dispose of the ashes at all. It’s about how to complete the grieving process in order to feel ready and able to do so. It’s this that can lead to the ashes being stored in a home for months, years, or even decades. The key to moving through grief is to complete your relationship with the person or pet who has died. Letting go of their ashes follows on naturally from that. I would not presume to offer a recipe for grief recovery in a short article such as this, but I can point you in the direction of an excellent book that is the best I have ever found on this topic. It’s called the Grief Recovery Handbook, and as the authors explain, it’s never too soon after the death of a loved one to address your grief. I’m sure that if the principles in this book were taught in schools, the world would be a very different place. Where’s the best place to store ashes in a home? If you ask ten different feng shui consultants this question you are likely to get ten different answers, according to which school of feng shui they have been trained in. But if you ask me, ashes don’t belong in the home at all. Physical bodies are created from planetary substance and are designed to return to the planet after death. 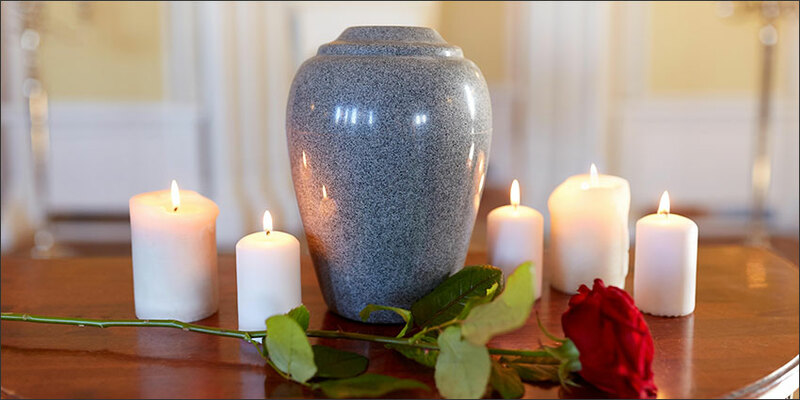 Keeping ashes in an urn or casket inside your home can temporarily delay this process, but there is no place you can put them that will enhance the energy of the space. In my view, they belong outside, either buried in the ground or scattered to the elements, so that the life cycle is complete. Copyright © Karen Kingston, 2014. Updated 2019. This entry was posted in Clutter clearing, Grief recovery. Bookmark the permalink. My brother just recently passed away and he was cremated. We are not wanting to keep his ashes in our home but we are wanting to purchase little necklaces where we can put some of his ashes in. Is that okay in terms of the grieving process? Will we be still holding on too long and not letting go if we choose to keep a small amount of his ashes in our necklaces? Hi Marcie – The grieving process is different for each person so I can’t possibly tell you how this will work for you. However, if you are asking me if this is something I would ever do if someone dear to me died, or if I would ever want someone to do this with my ashes, my answer is absolutely not. As I say in my article, burying ashes in the ground or scattering them to the elements completes the life cycle. Keeping a residue of a person encased in a piece of jewelry is an unnatural interruption of that process. I am having several dreams about funerals and coffins. My husband’s ashes are at home, it is already 2 years and 3 months. I start to think is time to put him in a place. I just don’t know where, but I think is time to let him rest! In Indian tradition we usually scatter the ashes in the ocean or a river. After reading your article it makes a lot of sense to “complete the life cycle” in that way. I am very saddened that many of my relatives have a lot of pictures of ancestors in the prominent walls of the house. Interestingly all of these photos have very cold expressions on their face (typical of photos taken in the 1900s). I have not had the courage to suggest to them to put up happy, joyful pictures instead. Hopefully one day they themselves will realise it! Hi, I have my dogs ashes in my bedside cupboard. When I die, my family have instructions to put the ashes in my coffin, then we can both be scattered together. So helpful, and much appreciated for both the book reference and discussion of ashes. With a deep thank you! Hi Karen, your reply didn’t surprise me at all. I would not expect any of the person to remain with the remains. Personally I don’t at all like the thought of having a loved one’s ashes in my home, my parents’ ashes were scattered in a Garden of Remembrance, which I could visit if I wanted to, but which it has never (in 28 years, my dad, and 18 years, my mum) occurred to me to do! They are, possibly, somewhere in the universe, but most definitely in my heart – and that’s all that’s relevant to me. I expect a lot of people think that irreverent, or cold, but I don’t see it like that. Hello, we have ashes urns with us, since nearly 3 years in June, Reno (our love one dog). It’s good to keep ashes urns with us? Some people say should give it way somewhere, said it’s about feng shui could be something happen? For us some times problem with families. So need your advice please, thanks. Hi Alamela – In my article, I explain that on an energetic level there is no reason at all to keep cremated remains. Nothing of the essence of your loved dog is in them, and if ashes are kept too long, stagnant energy can accumulate around them. This is why the practice of scattering ashes is so much better than keeping them. I suggest you scatter them in a place that your dog used to love. What about adding them to soil of a plant to keep inside? That would be a way of putting them back into earth, while bringing something symbolic to life. Any thoughts? Hi Robin – My article was written in response to all the people who ask me about storing ashes. What you are describing (adding them to the soil in your garden) is a lovely way of letting them go instead of keeping them. I am so glad to see you addressing this matter of ashes Karen. I have had several clients bring up the issue, asking where is a good place to keep them. Likewise, I could feel no auspicious place for a burial urn in the home. My favorite was a collection of pets residing on her fireplace mantle. Yes Karen, I agree. In the sixties and seventies I had my parents ashes in a special garden devoted to St. Francis built specifically for this purpose. Then neglected my share of my brothers ashes for the longest time until I took up practicing your techniques again. I put him in his favorite waterfall. My kids currently have had ashes of pets and their father around. So I’m glad to see your article. Thank you for taking the time to address this issue. In Japan ashes are kept in urns and at a certain point after death are put inside the graves. As far as I know everyone is cremated here and an actual grave consists of whatever “monument” a person builds – like anywhere, larger and more elaborate depending on how much money is spent – but the actual ashes stay in a part of the grave designed specifically for that. And graves are usually family graves so several urns of ashes end up in the same part of the stone grave/monument structure. I personally like the back to nature approach and many of the people before me in my family have been scattered in the ocean. For Japanese having a place to go to honor their ancestors is very important. Graves are visited here on the Spring and Autumnal equinoxes. This may be a solution : turn ashes into gems!! !